I’ve got another review for y’all today – I really enjoy making these posts and hope you enjoy reading them! This review is on the Nivea Soft Moisturising Cream. I have really dry and sensitive skin along with eczema, so finding a moisturiser that is super hydrating is crucial. I used to use the oil free Neutrogena one for sensitive skin, which was pretty good up until it stopped moisturising my skin effectively (not sure why, perhaps my skin got used to it). Don’t mind the random white spot… it’s nail polish – I had to use something to put the polish on while doing nail art and this was the closest thing, haha! So I went on the lookout for another great moisturiser and came across this one – it is extremely affordable as well, I believe it is around $10 for a 200mL tub (fun fact, I also saw a miniature version of this at Kmart which was so cute but pricey). 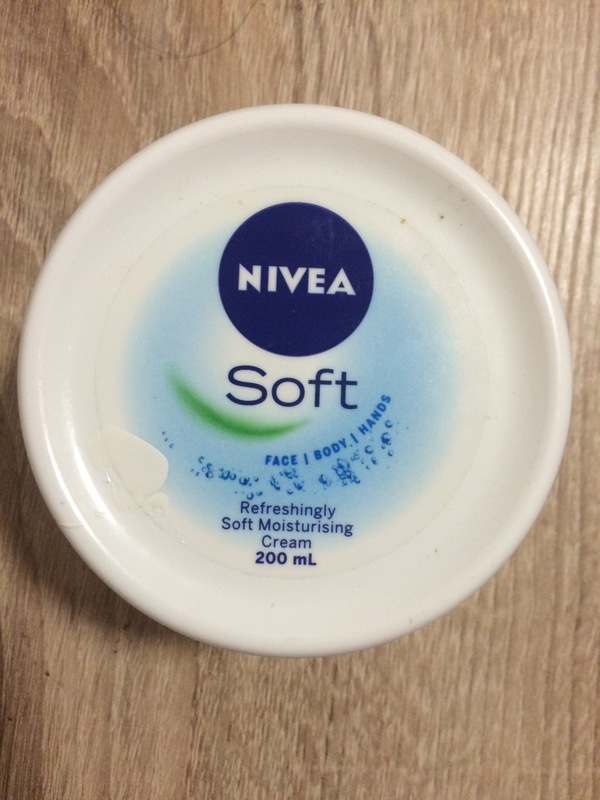 It feels really light weight when first put on and does a great job at moisturising my skin. I remember the first time I used it I was amazed at the refreshing feeling it had when I put it on my skin. The packaging is extremely secure/spill proof since it’s a screw on lid & I think it would be perfectly fine for packing in your suitcase. A con for this moisturiser is that it does leave your face quite shiny, so it is not ideal for oily skin in the morning when you need to go out soon after. Another con is that sometimes a particular part of my face (a small area) does not want to stay moisturised – but this is not consistent, it just randomly becomes dry some days, which I suspect may be from the wind or dry weather. Overall, it does a great job at moisturising. I definitely recommend this product if you’re after an affordable, effective moisturiser! I believe this is available in most stores in Australia (such as Priceline, Woolworths, Kmart, etc) and would be definitely available in other countries. What are your favourite moisturisers/thoughts on this one? I’ve been wanting to try out new ones and I hear the Neutrogena Hydroboost one is amazing (but costly which is a shame). I like the Garnier Moisture Rescue gel moisturizer. It absorbs I to my skin really fast, doesn’t feel heavy or greasy. I use the one for normal/combo skin (there’s a version for dry skin too). I also like Philosophy Hope In A Jar but it’s so spendy. I have a review of it on my blog. I’ll check it out! Thanks. It is such a great product, especially for its price! I use it as a bedtime moisturizer so the shine doesn’t bother me. Ahh that’s a great idea! I have dry skin and I agree there is way too much shine 😦 but for winter (elbows and knees) it rocks ! I have been a Nivea baby for as long as I can remember but due to its shine I keep it a handy ‘at home’ moisturizer. Great review … I completely agree with your thoughts! I can remember using this product when I was younger and now I am thinking, why did I ever stopped using this product😕. I need to get me a pot. Yess it is amazing and so affordable! Hehe.